I’ve been drooling over many a recipe on amazing New York based food blog Smitten Kitchen for the last year. I finally got around to trying out one of the dishes this evening. So glad I did. 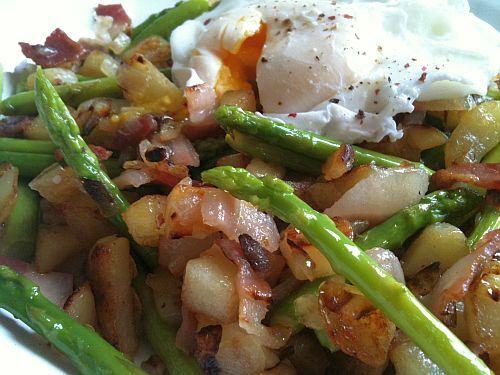 This Asparagus and Pancetta Hash would be simply fabulous for brunch but it worked super well as a comforting mid-week dindins. Niall is galavanting in South Africa this week so I vaguely followed Smitten Kitchen’s recipe to throw together a delicious meal for one. 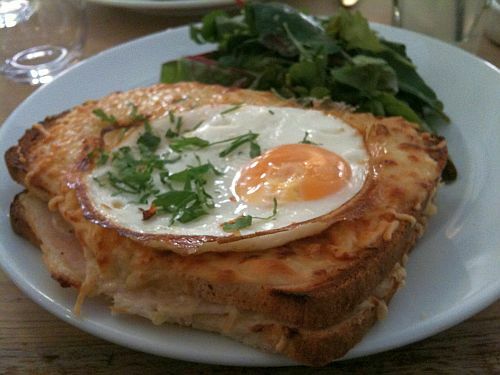 And I even popped an egg on top. Even though it was nearly bed time. The last of the lamb? 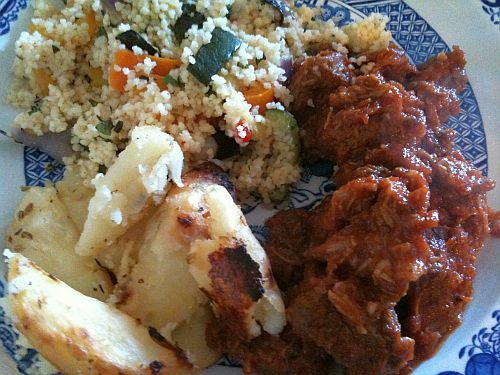 I feel I’ve taken good advantage of this year’s lamb by cooking a few decent stews since last month made up lamb from FX Buckley and Paddy Jack from the Temple Bar Food Market. 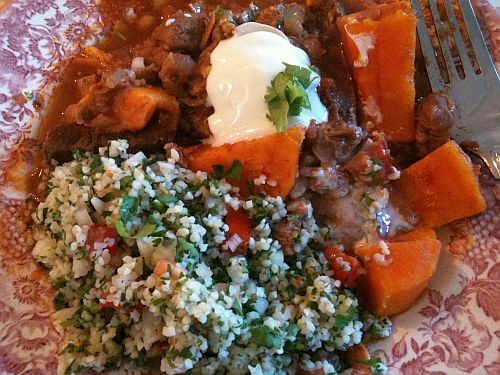 Last weekend, we had a biggish gang over and I went for lamb once more, using a Mary Codogan recipe for a Lamb Tagine with Sweet Potatoes & Dates from the BBC Good Food website. Yep! Still using the old faithful site. I also called my Mom to ask for her Tabouleh recipe. It’s the ultimate. 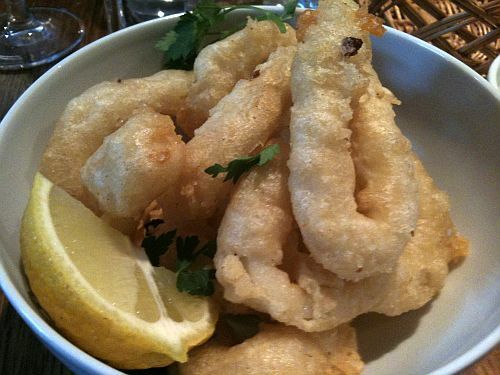 Calamares (€6.50)- you lovely squiddy things, you. Whenever I see Tapas advertised here in Dublin, I shudder. It’s down to one too many crap meals in The Market Bar – which I do remember being very good a few years ago but has sadly gone downhill foodwise – and a trip to Seville where we enjoyed the most amazing tapas at ridiculously cheap prices. Once you get a taste of proper tapas, it makes you dubious of places that purport to serve it over this side of the pond. We were in Ranelagh on Sunday with our Come Dine With Me buddies Alan and Colette, hungry for lunch after deciding not to bother trying to get into the over-crowded Taste of Ranelagh. We just missed the lunch at Dillingers, and decided to give Ochos a go, tapas-trepidation aside. It was lovely. Of course, it was way more expenisve than the Tapas in Seville but it was decidedly delish. We ended up ordering quite similar dishes between the four of us so I only have pics of a few of the dishes on offer at Ochos. Last Thursday night, myself and Niall went to see Rain Machine in The Academy. During the set, lead singer Kyp Malone (also of TV on the Radio) talked about how the band were going to be stranded in Dublin because of the Volcanic Ash Cloud of Doom currently hovering around European airspace. Thankfully, the Dublin show was the last date of a three week tour, so at least they didn’t have to cancel any further dates. However, the six members of the band all had plans to travel on to further destinations in Europe to have a bit of a holiday and rest time after their tour. However fun tours may be, they are also draining, and I think they had all been looking forward to relaxing and getting back to normality. I thought about how I would feel after three weeks of staying in hotels and eating out for every meal. I figured the thing I would want the most (after my own bed) would be a home-cooked meal. So, after the gig, myself and Niall had a chat with Kyp and Carmen from the band, and Niall asked if they wanted to play at the State gig in The Mercantile the following night in return for a lunch for the whole band at our house beforehand. They said they’d be delighted. The Bar With No Name, The Secret Bar, No Name Bar or 3 Bar – whatever you want to call this word of mouth cocktail bar on Fade Street, it has indeed lost any of the secrecy it cleverly marketed itself on last year. Located above L’Gueuleton on Fade Street, having no name outside and looking like the entrance into someone’s house, word of its exclusiveness spread throughout town while people flocked to drink in a place that was ‘secret’. Clever stuff. So, now we all know it’s there and serves exceedingly good cocktails, we’re totally over it. I mean, what’s the fun in going to a place that everyone now knows is cool? That would be LAME. In saying all this, a girl’s gotta eat. And so against my better judgement, I got off my hipster high horse and decided to give Brunch at No Name a go last Saturday afternoon. 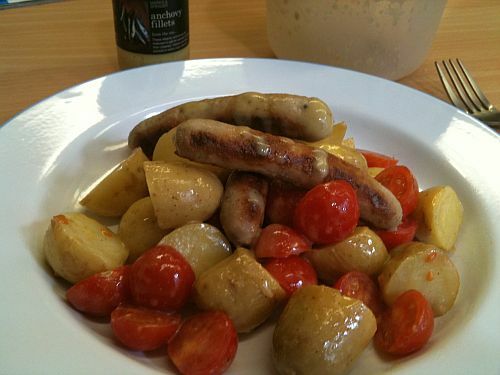 Tasty lunch to bring in to work – WIN. Not only am I big fan of Hugh Fearnley-Whittingstall’s River Cottage TV programme, I also enjoy his recipes in The Guardian on Saturday. Twas he who introduced me to the wonderful world of Arancini, after all. I picked up his River Cottage Every Day cookbook last week in Eason’s and was eager to try out something short and sweet (well, savoury actually). 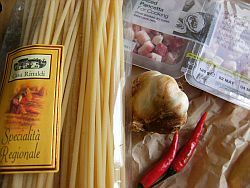 This little treat below for one of the Lunch Box recipes caught my eye and I had a particularly lovely lunch in my staff room at work yesterday. I took a few sneaky snaps on my iPhone of my lunch as it came out of my tupperware – luckily, my colleagues are well aware of this food blog and my propensity to photograph my food. I went on a bit of a food book splurge the other day in Eason’s, picking up a paperback copy of Jamie Oliver’s Jamie’s Italy, a lovely River Cottage Every Day book and a Greek cookbook (Ben?? Are you living in my mind?!?). I’m feeling back on the cooking bus and hope to try lots of new recipes over the coming weeks. I also grabbed a copy of the April/May issue of the Jamie Oliver Magazine. I’ve bought five issues altogether, and I’ve used at least three recipes out of each one, which isn’t bad for €5.95. I mean, I know recipes are free on-line but it’s nice to have something to leaf through at a lazy moment, especially as I don’t go in for the usual ladies’ magazines. The latest issue is an Italian Special, which is very exciting indeed. 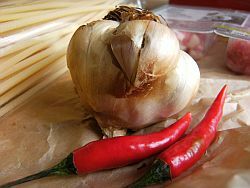 It’s got loads of stunning looking recipes for risottos, seafood dishes, puddings and countless ideas for Pasta Sauces. 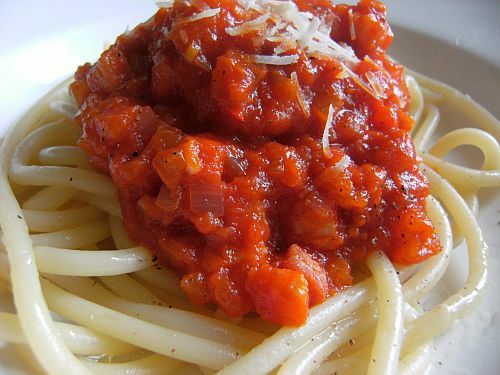 The below recipe for Amatriciana Sauce caught my eye and I whipped it up for a quick and delicious mid-week meal. It was bleedin’ gorgeous, as they say in the little known Italian region of Rialto. 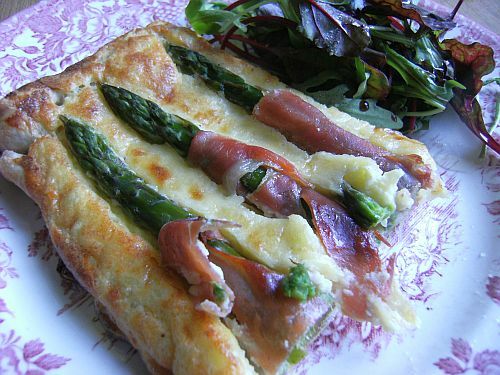 It’s been over a year now since I started this blog, and I’m back where I started with Asparagus and Jamie At Home! This is the first proper thing I’ve made since returning back from SXSW in Austin, Texas. My ma cooked for me yesterday (lovely leg of lamb) and we had our friend Ben staying with us last week who beat me to the kitchen every night. Which I was realllly not pleased about. Shee-ah! It was amazing. I had a couple of spare hours today while I was listening through tracks for my show this week on 2xm. I had some asparagus in the fridge so I set to work on this here tart. I was super pleased with the results. I ate half of the whole tart, so pleased was I. Feeling pretty carbed out of it right about now. A few months back, a friend of Niall’s told him about the Jen Ken’s Kit Kat Blog, wherein all of the various mental flavours of Japanese Kit Kats are documented and critiqued by Jen, an American living in Japan. My sister, who lives in San Francisco, was working in Japan a week or two ago and I sent her a link to the blog to make sure she was fully aware of the Kit Kat possibilities. And guess what arrived at my doorstep today from herself? 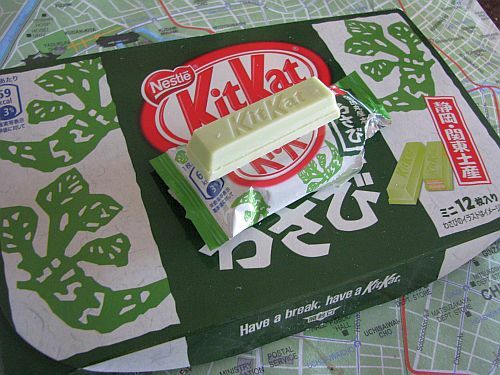 A box of Wasabi Kit Kat bars!! They have a fabulously light-green hue, and taste curiously of English Mustard. I’m not quite sure how I feel about them yet, but the novelty is certainly going to take a while to wear off. We had the most joyous of nights in Galway last Saturday for the 2010 Irish Blog Awards. Happily, Niall came away with the Best Music Blog award, leading to much merriment and supping and chatting and spontaneous singing and even a bit of rapping. And that was just me. Big congrats to all the winners, especially my foodie buddies at The Good Mood Food Blog (Best Food Blog) and 9 Bean Row (Best Newcomer). Feeling well rested and fresh *ahem* on Sunday morning we made our way to Ard Bia at Nimmo’s near the Spanish Arch at the end of Shop Street. I lived in Galway for a brief spell about 6 years ago, and had brekkie or lunch in Ard Bia at the end of Shop Street a number of time, loving the way the lady of the house called everyone darling and that she gave everyone little pots of honey instead of crappy plastic boxes. Nimmo’s was a seafood restaurant near the Spanish Arch which my Mum brought me to for a special treat one weekend she visited me. It was the first time I had ever tasted oysters and it was a really memorable experience. I had discovered the day of this year’s Blog Awards that my two favourite eateries in Galway had morphed into one since my last visit (which was aaaaages ago). I knew it was going to be good. And by golly, it was.